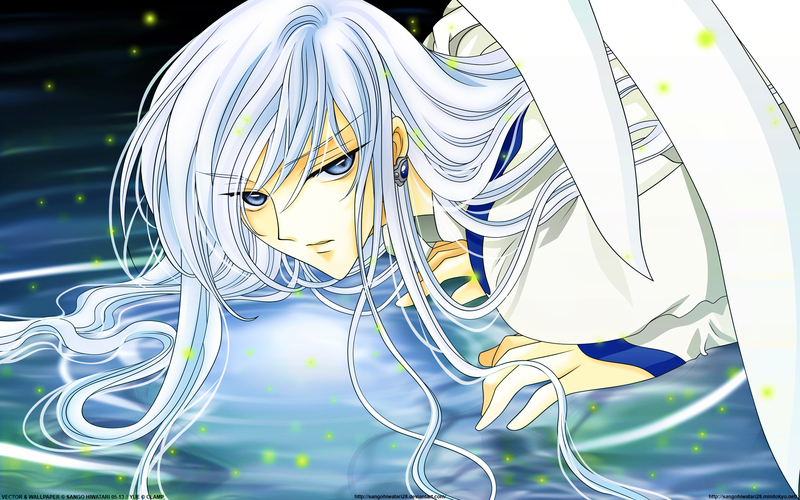 After I finished Kamui's wallpaper I really wanted to do another CLAMP vector, curse you clamp and your beautiful yet impossible bishounen >__<! Anyway, I found this loveable scan and gave it a try! This one was...pretty challenging, I redid a lot of the hair's line-art several times and changed the colors a lot too /: it was fun though .n. I spent two days thinking and looking for a matching background and yesterday I doodle some shapes and kept going 'till it became like this! ._. I was worried because the hair kept looking odd, thankfully with the BG and some details it looked better (: ! As suggested by Alenas and Kitaan I change the skin color, thanks a lot for your help ^^! Critiques and comment are well appreciated ^^~! love the colors here, you can give it more depth/darker shadings on some part but it doesn't really matter to me. Ooh, those eyes are really mesmerizing and you did a great job on the vector. The skin could be less yellow, though, it almost looks like he has jaundice, which is especially obvious in the dark yellow shading. Shadows/shading doesn't add to the color or makes it more saturated so some cooler shades of peach/pink would've perhaps looked better. approach for this scan. The vector is nice and neat, lines all seem to be smooth. This is such a beautiful wallpaper! No matter how my anime addiction grows, I will never forget the beautiful CLAMP classics and anime/manga classics. I miss watching Card Captor Sakura! Thank you for a beautiful wall and wonderful memory! I like this kind of picture. coloful and High definition! Please acept my congrulations! than you for sharing this picture. Wonderful wallpaper with beautiful colors ! I like it very much. To my favorites.